Coca-Cola Co. on Monday announced that it would be exercising a clause of change of control, which gives it the right to acquire the former interest of SABMiller in Coca-Cola’s largest bottling company in Africa. This move takes place after Anheuser-Busch InBev on Monday closed on its SABMiller acquisition creating a behemoth in the beer industry with a huge footprint in Africa. As of the latter part of August, SABMiller held a stake of 54% in the bottling company Coca-Cola Beverages Africa, which handles 40% of the distribution of Coke volumes across the continent. Coke, based in Atlanta, wants AB InBev at an arm’s length amidst speculation the beer giant based in Belgium will eventually try to take control of Coke. AB InBev is also a major bottler of drinks that are nonalcoholic in Latin America for Coke rival PepsiCo. 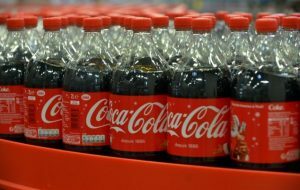 Coke also announced that it was negotiating with possible buyer who might acquire some or the entire amount of the former SABMiller stake in the bottling business in Africa. Coca-Cola and Gutsche Family Investments based in South Africa, another longtime partner in bottling with Coca-Cola, owned minority interests in Coca-Cola Beverages Africa. Coke has been going through the divesting of assets worldwide in distribution and manufacturing part of its strategy of asset light that focuses on the concentrate business that is more profitable during a period when the consumption of soda is slowing down. Analysts in the industry have said that possible partners with Coca Cola in Africa could be Coca-Cola European Partners, Coco-Cola Hellenic Bottling or Coca Cola Femsa in Mexico. Around the globe, Coca-Cola has hundreds of different partnerships with bottlers. Despite the decision by Coke to exercise its clause of change of control, for the bottling business in Africa, AB InBev will maintain some interest in the bottling operations of Coke. The brewer’s deal to take control of SABMiller includes a 20% interest in Castel Group based in France, which bottles Coke products in over a dozen countries in Africa, including Tunisia and Algeria. The company retains as well the soft drink bottling business of SABMiller with Coca-Cola in both Honduras and El Salvador, which represent less than 1% of the volume of Coke. Coke usually insists on the change of control clause with bottling partners that gives Coke an option to buy out the share of a partner if that partner becomes acquired by another party. Report: Uber Dominates Ride Market in U.S.